Welcome back to Hereville, where Mirka, the world's first time-traveling, monster-fighting Orthodox Jewish girl, faces her greatest challenge yet: babysitting! Mirka just wants to find new adventures, but instead she's stuck babysitting her disapproving little sister, Layele. 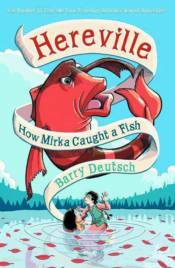 When Mirka pushes her sister into a stream, they both get in too deep with an angry magic fish. No matter how hard Mirka fights this fish-out-of-water, it gets stronger and stronger - and it's out for revenge. Mirka is in over her head, and this time, her whole family is on the line!